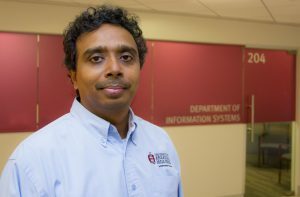 An article by researchers from the Department of Information Systems at the Sam M. Walton College of Business at the University of Arkansas and collaborators from Hong Kong and France published in the Academy of Management Journal was named the best paper of the year published in the journal. The article focuses on the economic challenges facing women in rural India and examines how women’s entrepreneurship can be promoted in rural India that in turn promotes greater empowerment of women. Authors on the research are Viswanath Venkatesh, distinguished professor and George & Boyce Billingsley Endowed Chair in Information Systems; Tracy Ann Sykes, associate professor; and Mary Macharia, a Ph.D. student at the Walton College Department of Information Systems; along with collaborators from Hong Kong and France. The article and its conclusions resulted from a seven-year study in 20 rural villages in India, Venkatesh said. Venkatesh is the No. 1 cited researcher at the University of Arkansas according to stats from Google Scholar, with his articles cited about 83,000 times. He is widely regarded as one of the most influential scholars in business. We address a grand economic challenge faced by women in rural India. We consider the interplay of women’s social networks (ties to family, to community, and to men in power), information and communication technology (ICT) use, and time in relating to the initiation and success of women’s entrepreneurial ventures. Results from a seven-year field quasi-experiment in 20 rural villages in India support the model. Ties to family and community positively, and to men in power negatively, relate to ICT use, entrepreneurial activity, and entrepreneurial profit. ICT intervention also strongly impacts entrepreneurship, with 160 new businesses in the 10 intervention villages compared to 40 in the controls. Results also demonstrate the dynamic interplay of social networks and ICT use. For ties to family and community, the amplification effect is such that the highest levels of entrepreneurial activity and success are observed among women with high centrality and ICT use—effects that increase over time. For ties to men in power, ICT use is associated with increased entrepreneurial activity only when these ties are low, but these interactive temporary temporal patterns do not emerge for profit. We address implications for the grand challenges of empowering women in less developed countries.